I am pretty darn tired by the time Sunday night comes around. That's not likely the way this is supposed to work, by the way. You know, "day of rest" and the like. Yet here I am, more or less exhausted. I know, I could blame it on the Chicken Pops - Part Deux, and maybe that's contributing to things this evening, but the harsh reality is that both my wife and I both tend to do too much. Here's an example: I had wanted to just spruce up some rocks I have underneath our dwarf plum tree, but for whatever reason, I randomly decided to pull out a bush on the side of our house. This particular bush serves no useful purpose unless you consider "aphid breeding ground" to be a useful purpose...which may be the case for aphids, but not for me. Anyway, 45 minutes and three yard waste containers later, the bush is reduced to a few sticks in the ground. This week I'll have to break out the pickaxe and complete my shrub murder. All well and good, but what possessed me to do it in the first place? I could have spent the time finally finishing a book or two. When my daughters were younger I had a valid excuse for moving around like a spinning top...and excuse called "functional parenthood". These days I have no more young children; the best it gets is a teenage stepson, and to be honest (and to his credit) he's fairly low maintenance. Yet here I am, Sunday at 10:15 pm popping Tylenol like they were M&Ms (plain...the peanut variety would make me vomit). I have brought this to the attention of my co-conspirator in life, Ms. Rivers, which is a bit like going to Donald Trump to complain about someone else's abuse of Twitter. That's a fancy way of saying that she's just as bad as I am in this department. In fact, she may be worse. Needless to say, I don't think there is a solution in the offing for this particular challenge, at least not anytime soon. Maybe this is because I simply don't like laying around being unproductive. Maybe this is because I have warped sense of just what "unproductive" really means. Case in point: If it helps me physically and mentally, perhaps it's not all that "unproductive" after all. This is to be continued. Chicken Pops Update: Some muscle soreness in the general area and a bout of two of intense itching, but this is looking like a relatively mild case. I also learned today that the chances of me getting this again are slim. Better at 53 than 73. It's all fun and games until the Chicken Pops come along. "Dad, I don't want to get chicken pops"
I was 19 or 20 years old when I got the "chicken pops". It was, I think, around January of 1983. To this very day, I can recall the intense fever I had, something along the lines of 103 degrees, for two or three days. There was also the incredible headache that brought, along with blisters in many creative places, including the soles of my feet. It was not a good time. Fast forward to 53 years old and I've been diagnosed with Shingles. You can read more about this affliction HERE. I won't bore anyone, least of all myself, with the details, but I'll note this: I woke up with an intense desire to itch in an unlikely place, and that turned into a feeling that literally makes me want to claw away layers of skin. Enter the red rash, a burning sensation, deep muscle discomfort and the beginnings (as of Friday night) of a blister or two. I'm sure this will get worse before it gets better. Yes, I bought calamine lotion, which does seem to help. I hope. For me, this is kind of end product. The American Academy of Dermatology (and others) note that being under great stress can precipitate an outbreak of Shingles. That's certainly been the case for me over these past few months. My story (make that stories) is noted in blog postings here since October of 2016, so there's no need for a rehash. What I will add is that I've periodically had to deal with what I consider to be bouts of depression over these past few months, something I've never admitted to before, but which can easily be alluded to between the lines of many postings. While I've certainly met my obligations...be they to my family, my (new) co-workers, and to myself (in finishing my Master's degree course work)...it's sometimes been at something of a steep price. I think Shingles is part of paying that price. This also isn't the first time in my life that a physical failing has followed periods of intense stress. I wish I had some kind of grand philosophical statement to make that would put my life of late into a kind of proper context, but I don't. Maybe it's the intense itching at the moment. What I do know is that I am hopeful for a kind of separate peace now. None of us truly know what life has in store, but looking forward, I'm hoping for a break from death, from self-doubt, from mental ruminations, and from the physical unhealthiness that comes from mental, physical, and emotional exhaustion. Maybe this is the period at the end of one sentence, with a new one soon to be written. It's just that this particular period is red and intensely itchy at the moment. Today's installment of incredibly bad phishing brought to you by Lisa Brown from United States. 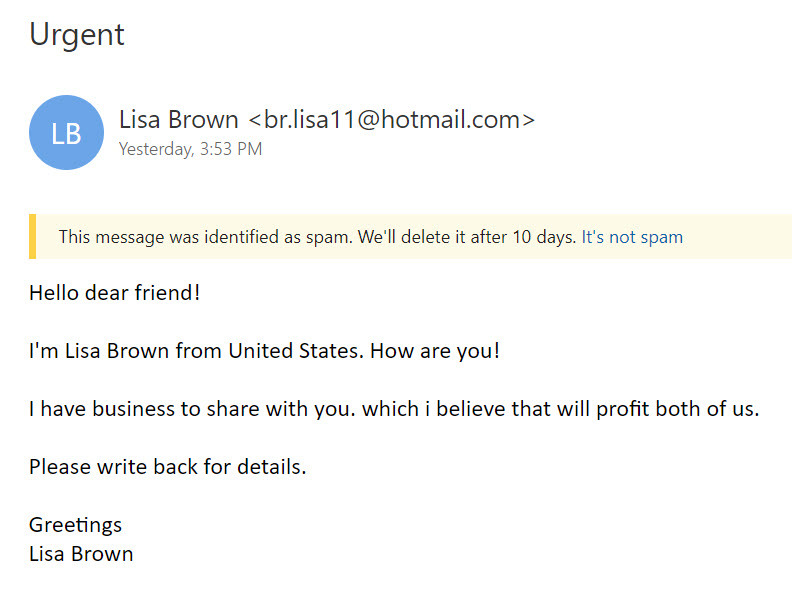 Now that Lisa Brown has told me that she is from United States (as opposed to, say, the United States), and not, for example, from Burkina Faso, I'll be sure to write back for details. 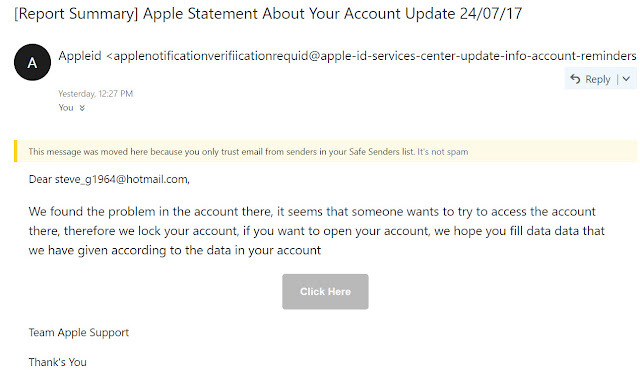 Oh, and also, Team Apple (there) has been gracious enough to let me know that they've found a problem with my account (there), therefore they are willing to help me fill data (whatever the Hell that means, there). I genuinely think that I could have a career writing phishing emails, because some folks just really, really need help (there). Preface: I wrote this several years ago, and for whatever reason (perhaps because it "sucked") I never published it. Here I am though, it's Sunday night, and I have almost no motivation to write about anything. And, by the way, I enjoy writing, and as such, I promised myself that I'd post no less frequently than weekly. Sometimes more frequently. Anyway, for the moment, I seem to be running low on blogging units (a concept copyrighted by local blogger Gort42), and yet I am filled with guilt over the prospect of not blogging at least weekly. What to do? Recycle, that's what; see the posting below. Here's to a new supply of blogging units, arriving soon. Oh, and here are two random picture of an Osprey sitting on its nest. 1. Peanut Butter - I think peanut butter is the most vile, disgusting, acrid substance known to man. I don't know how my fellow human being can even consume it. The smell alone makes me want to vomit. Writing about the smell makes me want to vomit. Carrion is more appealing. 2. Roasted Peanuts - I actually don't mind the smell of roasting peanuts. Just don't turn them into butter. See #1. 3. Books, Part 1 - I am usually reading two or three books at a time. 4. Books, Part 2 - None of the books noted in #3 are fiction. 5. Television - I really only need four television channels: WNEP (for news, in the morning), BBC America (for Top Gear...at least until the new host starts, then it's "see ya"), whatever channel is playing Family Guy, and whatever channel is playing those shows about dingy looking people living in Alaska (and I'm not talking about the Palin family either). 6. Religion - I don't consider myself religious, although I am a avid reader of religious material; in high school I read every book the Scranton Public Library had on the Church of Jesus Christ of Latter Days Saints, even though I had no desire to become a Mormon. As a side note, I recently saw the Book of Mormon musical, and it was hilarious. I do pray from time to time, although I think the act of praying has more to do with getting my head straight than it does actually wanting something from God. 7. Politics - I don't align with any political party, and quite frankly I think political parties are, well, stupid. Neither political party has a monopoly on the truth. I also think that party line voting should be illegal. I vote for candidates based on their ideas, not political philosophies spoon fed in neat little sound bytes. 8. Abortion - Gee, should I even include this? Well here goes nothing. When it comes to the whole abortion debate, I just wish there was less screaming, yelling and finger pointing and more genuine compassion from and for all sides. Note the word "genuine", as in what isn't typically seen when politicians talk about abortion. It bothers me to no end when elected officials use this issue as a wedge simply to court some kind of political base (where the real desired outcome is the accumulation of political power...ponder just how horrible that really is). 9. Guns - I don't like guns, but heck, if you do, well more power to you. Fire away. Please just don't point it at me, bring your gun into my house or my place of business. 10. Hunting - I try very hard to not kill things. This includes insects, spiders and other kinds of critters. I wish I were disciplined enough to be a vegetarian, but I'm not, so I'll just have to live with that contradiction for the time being. Now if someone does like to hunt well that's okay with me, but I hope they do it in a way that provides the bare minimum of discomfort for the critter(s) involved and the resulting "kill" is eaten or otherwise used in some meaningful way. There's a difference between responsible hunting and animal cruelty in my book. 11. Animal Cruelty - See #10. It's my educated opinion that anyone who is capable of torturing an animal is also capable of torturing a fellow human. In my world, there wouldn't be much difference in the sentences for assaulting a human or assaulting a defenseless animal. 12. Cats vs Dogs - I love cats, but I readily confess to not being a good enough person to own a dog. 13. Music - I love music, but I don't have musical bone in my body. My signing voice is somewhere in range between Michael Jackson and a 12 year old boy who is about to enter into puberty. 14. Sports - I love to play sports, although I don't have much time for it these days. Growing up I was constantly either playing tennis, basketball or baseball (in a real sandlot near where we grew up). Watching sports? It puts me to sleep. Too much watching sports on television can, I think, create the need for a lobotomy. 15. Radio - I am an avid Howard Stern fan. He is a genius, on par with Hunter Thompson & George Carlin, who created his very own radio genre. Political talk radio? I think its a wasteland for those who are searching for someone to think for them. 16. Tattoos - I will never have one simply because I get bored far too easily to have something that permanent drawn upon my body. While it's not for me, I've seen a few stories about tattoos being used by breast cancer survivors (link to an article HERE), which I do think is incredibly wonderful. Oh, and let's get one thing straight: If you get "Ozzy" tattooed on your knuckles, then please don't complain if you have trouble finding a job. Self-expression is a wonderful thing, but broadcasting stupidity is another. 17. Drinking - I confess to drinking far too much diet soda and ice tea. Alcohol? I may have a drink of it maybe once or twice a year, if that. Seriously, I really don't like the taste of booze, and I like even less how I feel after drinking booze. 18. Earliest Memory - My earliest memory is of watching a black and white Superman cartoon in a half double home we lived at on Pine Street in Scranton. I'm not sure of the age, but I might have been two three. 19. Biggest Personal Frustration - I have what I'd describe as a frenetic mind, which while it allows me to be interested in lots of different things, has more than a few drawbacks. I'm sure my incredibly short attention span plays into this as well. The worst part of it? That's waking up just about every morning with all these thoughts in my head. There are times when I'd give all the money in my wallet for just five minutes of true mental calm, especially in the morning. Sometimes when someone asks me "what you are you thinking" I don't answer honestly, as doing so would both take too long and the answers would be far too disturbing. 20. Biggest Personal Regret - Sure I have regrets, but even the time spent thinking about them for the blog blurb is a waste. What's done is done. Pay attention to the past only to the extent that it can actually help in the present. 21. Biggest Health Challenge - Bad sleeping habits. As I've noted here many times, I don't typically sleep well. See #19. I think they have medication for this...Thorazine maybe? I am joking about the Thorazine part. 22. Power - Obtaining power...be it at work or at home...simply for the sake of having power seems immoral to me. Besides, real power doesn't come from controlling or having control over overs, it comes from having control over yourself. 23. Famous Person Dinner Game - If I could have dinner with a few famous people, who would be in attendance? Well for starters, my wife would be invited. Second, my list would be as follows: Emily Dickinson, Hunter S. Thompson, Paul McCartney, Howard Stern, Berkeley Breathed, and Albert Einstein. 24. How I'd Like To Be Remembered - If anything, I'd like to be remembered as a good Dad, a loving partner and a kind human being. Friday's Travel...spilled into Saturday, technically speaking. The final toll was as follows: One completely canceled flight (Dallas to Philadelphia), two flight delays, two re-bookings, and a two-hour drive home from Harrisburg, arriving at 1:30 am. My luggage, by the way, didn't make it to Scranton until about 3 pm on Saturday. In the midst of the insanity, there were rays of light...the Avis counter person (Michelle) in Harrisburg, who found me a one-way rental, at 11:30 pm...the gate agent in Amarillo who got me re-routed, even if I ended up having to revise things further...the baggage staff in Harrisburg, who made sure my luggage got to me, even if it was a day late. As I've noted here from time to time, there is nothing glamorous about business travel. Lawyering, Scranton Style...I've been reading the verbal grousing between a certain local lawyer, the Scranton Times, and a Scranton City councilman. Here's how I see it: Whenever you have $400,000 that is paid out to a person(s) or firm(s) without bidding OR detailed records to document the work performed OF COURSE there will be flags raised. There should be flags raised, by the way. The fact the lawyer/law firm in question also significantly contributed to Mayor Courtright's campaigns over the years only makes it smell worse. This is old-school Scranton back-room dealing at its finest. In the end, it's entirely possible that the legal expenses in question were justified, but this is public money at play, so there needs to be more...not less...transparency. Blaming the Scranton Times for continuing to raise this as an issue is SILLY (at best); what's the alternative? Simply take Mayor Courtright's word for it? Confederate Monuments...Apparently, there is all the rage over monuments to Confederate generals being moved and removed in places across the south. My blunt assessment? Why do we even have monuments to traitors in the first place? The National Political News Blackout...continues on my end. I'm simply not interested in the latest Tweets or scandals...real or imaginary...that are in the national news. None of what's happening should be a surprise to anyone. (the Catholic Church) It's Almost Official...There are practically two versions of the Roman Catholic Church in the United States today, at least as evidenced by competing books that deal with the LGBT community within the Church. There's a very good article that touches on that point HERE. As someone who does listen to militant right-wing Catholic radio (EWTN, Ave Maria Radio), it's pretty clear that the Church is suffering from an ideological split that fairly well mirrors the political split within the United States. In fact, just listening to discussions about secular issues on militant right-wing Catholic radio will make you think that you're listening to a stereotypical ring-wing talk-radio host. Just add a few references to the Magisterium and Mary and you've got the whole programming for militant right-wing Catholic radio fairly well locked down. Blogs, #1...A former co-worker of mine writes a terrific blog that you can find HERE. Her latest posting, The Retiree, touched on a few raw nerves for me, which I so noted in a rather lengthy comment (sorry about the length Michele). I debated responding to the posting, but in the end, I am glad I did contribute my thoughts. I do get anxious whenever I post something that's critical, by the way, even given my tendency towards restraint. The fact is this though: We are all called to always be decent humans, first and foremost. We all fail at that from time to time (me too...well, especially me), but that failure is compounded when that it seems to be institutionalized, somehow a human failure of a planned sort. My final word on this: Always treat people the way you would like to be treated, be it in business or in your personal life. Period. By the way, I actually interviewed the author the blog in April 2014. You can read that posting HERE. Blogs, #2...Andy Palumbo recently commented in a blog posting about how disappointing it is that people don't stay with blogs they start (my words; his words can be found HERE). I concur with his sentiment, but with a qualifier, namely that I think sometimes blogs have a hidden purpose, and that purpose gets fulfilled in a time-frame that is all its own. There have been times when I wonder why I write this, but then I remember the purpose of NCFE, which is basically a way for me to help explore things, to help me make sense of the world (the world that mostly exists in my head). That need is not likely to go away anytime soon. A few minutes to spare after packing but before leaving Amarillo, taking a long series of flights back to Northeastern Pennsylvania. It's been a mostly good week. The bad? Well, let's call it "butter overdose". It happened Tuesday evening, with a dinner that consisted of far more butter than my system was capable of handling. That sort of thing has happened before, well many times before, and you would think that at my *advanced* age I would know better, but I am nothing if not consistent in my failure. The result was waking up very early on Wednesday and an hour of so of dry heaves. I survived. I can't compliment enough the folks I worked with this week. Exceptionally decent human beings. It felt to be "back in the saddle again". To that second point, I've spent a good part of my professional life facilitating workshops/discussions/learning events...I don't like the word "training" (that's another blog entry for another time)...and it's something I haven't done in any significant way in over 9 months. This week felt, well, great. Being in a conference room, having audiences, reading faces, making mid-course changes, developing material on the fly, getting challenged on something I said, answering questions...it's all both exciting and oddly comforting for me. I imagine that this must be how a musician feels after they haven't been able to play in a while. I'm heading home feeling accomplished. The one was Texas medicine, the other was just railroad gin. See HERE for the title reference. Greetings from the land of the flat and the hot. After something like a 20-year absence, I'm back in Texas on company business, although the 2017 version is a different company on different business in a different location. The forecast for Amarillo, from where I type this? 94 degrees and incredibly sunny. Every day. All week. The sky is a kind of scorched blue. Not a deep blue you might see in Pennsylvania, but a washed-out variety, as if the sky itself was in the process of getting a tan. Anyway, although I've probably spent, in total, maybe three weeks of my life in Texas, I've always felt that there are two versions of the state: The one you hear about and the one you actually experience. Part of what you hear about when Texas comes up is that it's the state of Ted Cruz, rabid anti-equality, fundamentalist Christian, and guns literally everywhere. I'll be honest, that's never been my experience. In fact, I've seen far more "open carry" nuts folks in Pennsylvania than I have in Texas. And despite the impression one might get from the somewhat lizard-esque Senator Rafael Edward Cruz, I've met almost no one in Texas who wasn't incredibly nice. Incredibly polite. Whatever the opposite of acerbic (and Ted Cruz) is, quite frankly, seems to describe most Texans. Case in point: While eating dinner, I observed two older couples meeting in the restaurant. One couple introduces a teenage daughter. She actually more or less genuflected as a sign of politeness and respect. You won't see that in NEPA, well, outside of a church. I'll also note that the folks I'm working with this week epitomize what I noted above about Texas. Just plain and simply nice people. And the office they work in is shaped like an egg. I kid you not. It wasn't always this way, for the record. My first actual airplane flight was in 1989, and I was barely 25 years old. 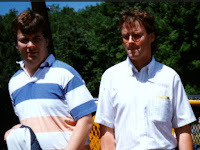 It was from Newark (NJ) to Boston, on company business. As I recall, that was shortly after smoking was banned from domestic flights. Ponder that one for a moment: Being stuck inside a pressurized tube, breathing cancer smog. Anyway, since then I've flone many more times, sometimes even for pleasure. Like many things over the past (nearly) 30 years, flying has gotten far more complicated and far less comfortable. At the moment, for example, I an stuck in a window seat that BARELY allows enough room for my lungs to expand and contract. I also have almost no room to move my arms, which translates to my very uncomfortably pecking out the beginning part of this posting. Travel itself, in general, has gotten more complicated. I now possess one of those AM/PM pill holders, a fact that makes my wife hang her head in sheer, utter shame. Granted, some of what I pack isn't prescribed...a vitamin, joint health supplements (2 pills that are so big that I look like a stork downing a turtle when I swallow them), and a probiotic (that I take on the advice of the future Dr. Albert). The actual medical stuff is enough, though, numbering more than 1 but less than 37. Add in 2 asthma inhalers and you can see that this is something of a production. One of these days I will post about the physical toll that my 30's and 40's, especially in the area of stress, has taken on me. I should also note that, as a general rule, I don't like touching or getting touched. Yet here I am, arm to arm with a 300 lb + seat-mate. At least he didn't object when I had to get up to go to the bathroom. That happens, by the way, all too often. When stressed I tend to do two things...bite my nails into bloody stumps and, well, pee often. As of this moment the finger next to my right thumb is crying out in surrender and, suffice to say, I'm trying hard to not think about my bladder. The latter is not helped by typing this...nor is the former...although pecking out posting at least helps to prevent more nail gnawing. Probably the only good thing about flying is the fact that the view out the window...any window...is usually breathtaking. It also reminds me of just how big the real world actually is, and how small the things that irritate all of us in the daily grind actually are. I still wish I had more room though. This is, by the way, the first business trip I am taking with my newer employer. My previous gig had a decent number of very specific travel policies. My new employer? I looked and found hardly any. I asked our Finance guy, and his response was basically along the lines of "...just don't be a jerk". Good thing I tend to be a cheap date. We don't have a corporate card, so if I was a jerk, well, the joke would be on me anyway. Speaking of former employers, three leaders I used to work with recently lost their jobs, although this time they had to work through their 60 day WARN notice period. I confess that it brought back a few flashbacks for me. I won't get into the morality of layoffs, but I will note this: Rationale aside, how such things are executed matters, an awful lot. A leader can deliver that kind of news in a direct but empathetic way. My actual notice lacked that empathy, but I was treated very well by those who explained the financial details of my separation. I know I have mentioned that before, and I will likely mention it again, as it was equal parts trauma and life-changing. My hope for my 3 former colleagues is that their next chapter takes them places they otherwise never would have dreamed going. Time truly is relative, and I'm not talking about couples dating in Arkansas by the way. No, while time may be constant in terms of measurement, how it's experienced is sometimes highly subjective. Which brings me back to July 3, 2015. Having both been married previously (and done the "big church thing"), Ms. Rivers and I, when we decided to get married, didn't want any repeats of history. In getting married the second time, we both just wanted to do something that was first and foremost simply fun for us and for those in attendance. Maybe that's one of the biggest changes between first and second weddings: The first time it's about you and the show, although in all fairness, you mostly don't know any better; the second time it's hopefully more about the things that actually matter (mainly because, by then, you should know better). We approached the planning process from a project management perspective. I kid you not: We actually created a project plan. 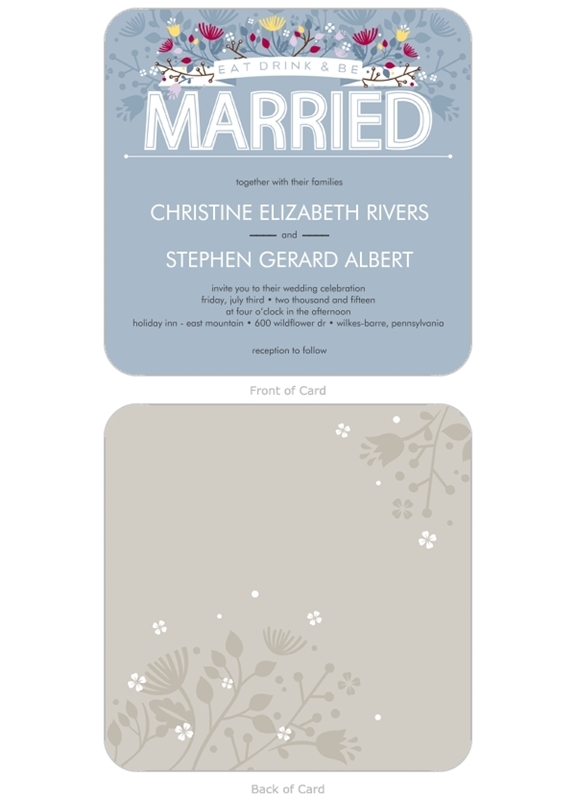 That was actually very helpful and further aided in making the whole process far less stressful. When all was said and done, it was a truly good day, and I'd like to think there have been many more good days since then. ...on the other side it has our initials. 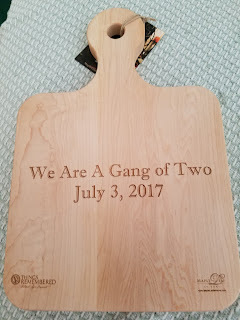 The phrase, "We are a gang of two", I am told comes from something I wrote on the blog, all be it somewhat paraphrased. I'd look it up, but why bother? 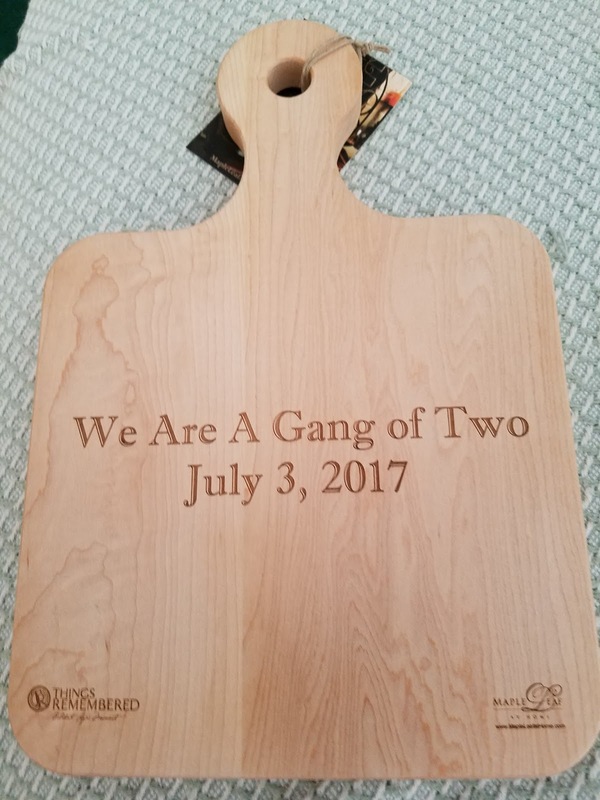 In a way, talking about project planning a wedding and getting a cutting board as a gift almost perfectly represent just what we've both tried to do in our lives together: Live simply and love wholeheartedly. I don't know what my next anniversary (or even tomorrow, for that matter) will hold, but I do know that if it all ended abruptly, I would still consider myself blessed a thousand times over. I'll end this posting with a song...one specifically that we played at our reception...and one that was immortalized in a framed print given to us by my daughter Rebecca.